Brewed is the vegan brunch of Brighton. The home-made ingredients in Nick and Tom’s fry-up simply sing from the plate. 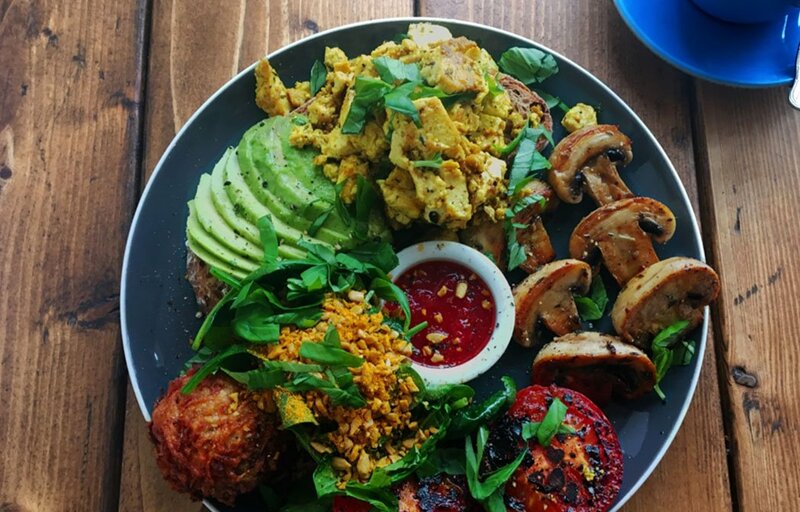 The soft turmeric scrambled tofu pairs wonderfully with the tangy, sweet chilli jam. My favourite, the hash brown ball, explodes with flavour and goes perfectly with a slice of grilled tomato. Dukkah, sprinkled on a bed of gently wilted spinach, beautifully accompanies chunky mushrooms, coated in a garlic and thyme herb-oil, which are softened by creamy pieces of avocado on toasted sourdough. But it’s not just the food that consistently keeps me coming back; the single origin coffee, in-house, is exquisite! A favourite hangout amid locals in town, Marwoods is equal parts wonderfully abnormal and entertaining. Whether you want to visit for a coffee, some beer or a cocktail, eat some vegan cake, have a sandwich or a vegan sausage roll, listen to a great DJ on a Friday evening, maybe attend a life drawing class, or learn how to paint – this is the place to come. Nothing quite makes sense here as crazy bric-a-brac hangs from the ceiling and walls, and toys, books and retro 80s relics find themselves in and amongst the mix-match furniture. But then that’s half its charm. This arts and culture café is a great place to meet people, connect with the local community or get down to some work. The layout is open and spacious – plants dangle from the high ceiling, interesting monthly exhibitions hang from the stone walls and the vibe is super cool. The coffee is delicious and there’s a great selection of vegan breakfast and lunch options. Flavour, texture and temperature are what this café is renowned for – try one of their eight flavours of chilli jams! Be sure to catch the lovely owner and chef Mitch, who will give you a real taste of what this creative side of Brighton is all about. Fantastic, wholesome Caribbean food legends playing great reggae tunes! There’s a great range of vegan options – the steamed rice and peas, dumplings, jerk sauce and callaloo spinach is one to cure any sins. The juicy greenery is one of a kind and loaded with seven different irons – people swear by its healing powers on a hangover! Owner and Jamaican chef Roy certainly puts his heart and soul into these delicious delights- places like these are hard to come by in the busy Brighton scene, but if you have the time to give, it is a must. Situated in the Open Market – the beating heart of Brighton’s local community- this spot makes for a wonderful and authentic hang out to eat the best hummus in town. Run by siblings Sarah and Christian who have been making hummus for over 35 years, you won’t be disappointed by the affordable, fun and healthy plates of food. Everything is homemade, and the importance of flavour and taste is what this vegan deli lives for. Every vegetable on the plate comes from the market opposite and the combination of flavours- from the almond tapenade to the pureed butternut squash with a tahini and date dressing- goes above and beyond in savour.